The memory oscilloscope of the PCE-DSO5000 series has the following band widths: 60 MHz, 100 MHz and 200 MHz. The memory oscilloscope is equipped with two input channels. At a large high resolution display the operator can directly read all measured parameters from the memory oscilloscope. The memory oscilloscope offers many options to record graphs and review them deferred. The data can be stored at a USB flash drive. 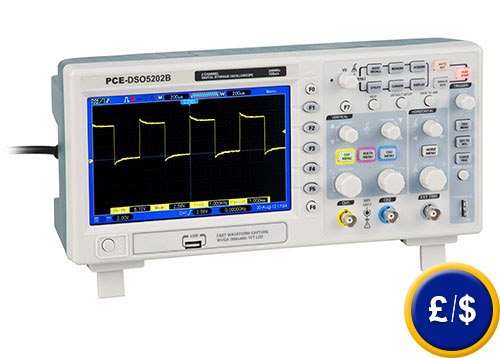 Besides the large band width the memory oscilloscope from the PCE-DSO5000 series has a sample rate of up to 1 GS/s. 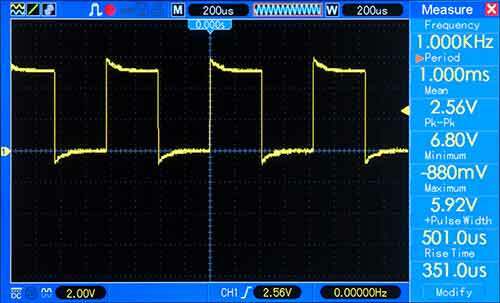 Additionally to different automatic measuring functions the memory oscilloscope can trigger at fixed points. Thus for example only the first rising edge can be shown or only the last trailing edge. The coloured marking of the input channels allows a quick work with the memory oscilloscope. By default every memory oscilloscope is equipped with an auto-set function that adjusts automatically the setting for the vertical and horizontal deviation. For further information about the memory oscilloscope PCE-DSO5000 series, please read the following technical data or call our Hotline: UK customers +44(0) 23 809 870 30 / US customers +1-410-387-7703. You can also reach us through our contact form. Our engineers and technicians will gladly advise you regarding the memory oscilloscope PCE-DSO5000 series or any product in terms of regulation and control, or scales and balances of PCE Instruments. AC, DC, LF rej, HF rej. 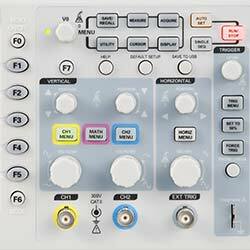 The clear control panel of the memory oscilloscope from the PCE-DSO5000 series allows fast working. The rotary fields and connections are highlightened, thus a definite allocation is provided. Besides the measuring inputs the memory oscilloscope is equipped with an input for external triggers. Additionally there is a connection at the memory oscilloscope built in order to check the probe head and the memory oscilloscope.